If you’re looking for a refreshing yet serious white wine that’s way off the beaten path, this is it. If I had to personify this wine, I would liken it to Kevin Kline in “French Kiss.” It’s really edgy, I’m not sure if I LIKE it, and yet I can’t help loving it because it’s charming, very interesting, and one-of-a-kind at the same time as it’s being prickly. NOSE: A cross between a Viognier and Sauvignon Blanc-like nose at first—tart, a thread of cat pee, but more steely. TASTE: A still, dry wine. Salty, green, very tart—gives way to lychee, honey, wet stone, minerals, mango. A peculiar edge: a hint of a soapy taste that seems to be a characteristic of Torrontés, as it’s been present in the others I’ve tasted; it’s actually very interesting. Astringent, cleansing. MOUTHFEEL AND FINISH: Crisp and acidic. Rounds out mostly mid-palate; tangy, spicy finish. LABEL: The Southern part of the Inca civilization once ruled where our estate vineyards are now located in Cafayete, Salta, Argentina, at 6,000 feet above sea level. 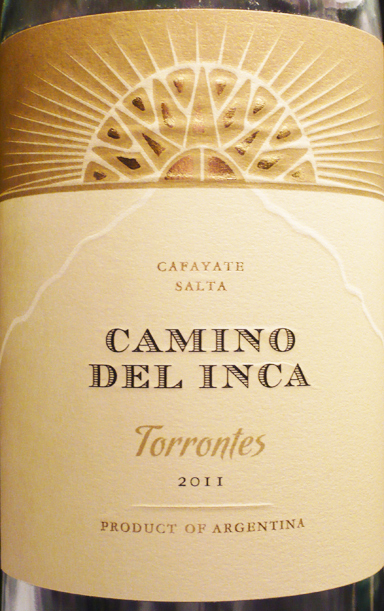 This Torrontés beautifully expresses its Salta terroir: explosive aromas and flavors of tropical fruits, white flowers, and honeysuckle. It is balanced in the mouth. TECH NOTES: Stainless steel aged, no malolactic fermentation. Average 45-year-old vines. WINERY NOTES: Our vineyards are located in Cafayate at 1,750 meters (5,740 feet) above sea level. Today we have 192 acres of our own vineyards, planted with the utmost care and divided into two estates: Río Seco and El Retiro. 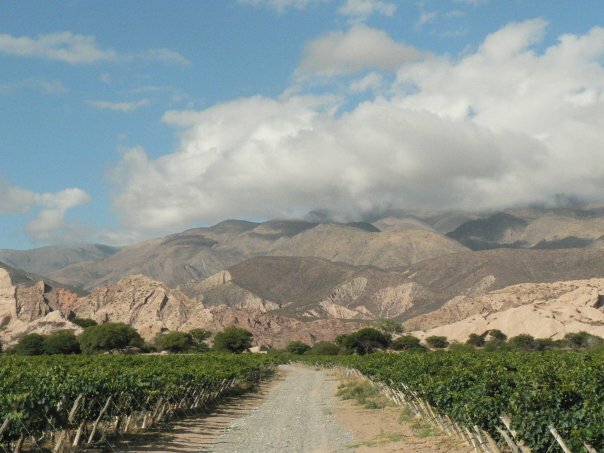 The climatic characteristics of the zone of Cafayate are perfect for the development of high-level vitiviniculture. The deep, sandy soil, poor and without limiting topsoils, gives us the perfect base for the cultivation of the vines. The temperatures are truly ideal, as due to the altitude of the zone we have a day-night difference of 15- 18ºC (59-64ºF) during the vegetative cycle of the vine. This translates into a notable difference in the polyphenols in the wine compared to lower altitude zones, giving wines with better structure and color, more suited for oak aging and for the later storage and favorable evolution in the bottle. The solar radiation necessary to bring the grapes to an optimal ripeness level is guaranteed by at least 350 days of brilliant sunlight, which allows for easy ripening in every facet of the plants every year. In respect to rainfall, it varies, with some years more dry and others more rainy, but the average yearly rainfall is only 120 millimeters. Outside of these rare periods water is provided to the vineyards through very well-studied irrigation methods, with which we can manage almost every factor that goes into the quality of the grapes. Finally, we are almost completely free of hail, which is a much more serious problem in the other vitivinicultural regions of Argentina. El Porvenir de los Andes was founded in 1890 by a family of Italian immigrants who settled in the Cafayate Valley. In 1999 it was reborn as a premium winery upon being bought by the Romero-Marcuzzi family, who knew the region and were inspired to develop a successful vitivinicultural project. This interest had begun in the 1980’s when the family owned a winery in Tolombón, 14 kilometers from Cafayate. IMPORTER: Vino Del Sol, www.VinoDelSol.com. Since 2004 we have built our reputation as a leading importer of terroir-driven wines that over-deliver in value. Known as “The Argentine Wine Specialist,” we also market exceptional wines and sakes from California, Chile, and Japan. All of our producers are estate-grown, sustainably-farmed, and family-owned. Our wines have received hundreds of 90+ point reviews. This entry was posted in Argentina, Torrontes. Bookmark the permalink.